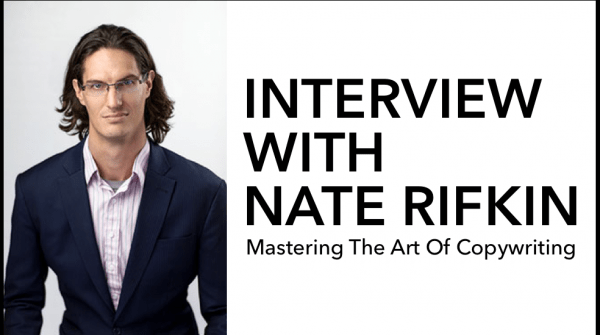 Nate Rifkin is one of the most prolific and successful young Copywriters of his generation. His clients include publishing behemoth Agora, as well as starting his own nutritional supplement company. But, unless you have a large budget it is almost impossible to hire him! So we are very fortunate that Nate agreed to do a Skype Interview for us. 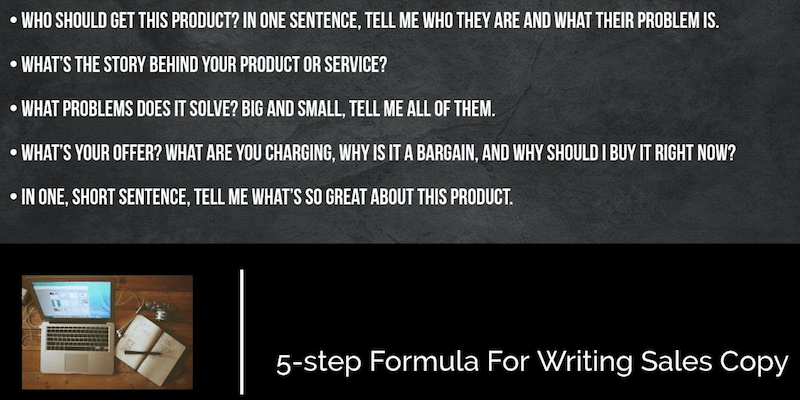 # 5-step Formula For Writing Sales Copy. # Why sometimes too much knowledge can be a hindrance. 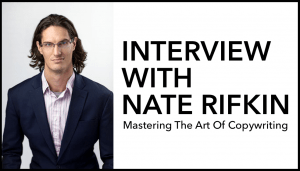 We started our interview by asking Nate how he got involved in being a copywriter? 1) Who should get this product? In one sentence, tell me who they are and what their problem is. 2) What’s the story behind your product or service? 3) What problems does it solve? Big and small, tell me all of them. 4) What’s your offer? What are you charging, why is it a bargain, and why should I buy it right now? 5) In one, short sentence, tell me what’s so great about this product. Nate Rifkin: …when I was around college age, in fact just entering my first year, I’d be surfing the Web. I’d find these odd, really long letters. They were sales letters. I didn’t know what they were.They just read like these letters where someone who had just written a book or put together a DVD course, let’s say it was on fitness or health or something, they would describe this amazing story of the struggles they went through, what they did to overcome them, all the things they learned, and talked about this product that they self-published and that they’re offering. I would buy these courses. They were pretty cool. That’s when I start to actually discover this is a whole business. It was a way of bypassing a traditional publishing house or even just lucking out and getting involved with a massive business that creates products and being your own business owner and creating your own products. I always loved writing, so I decided I was going to scour the Internet and search around, and study, and buy everything I could on how to write these kinds of letters, because I wanted to be in business for myself, and I was just some little guy. I didn’t have any connections. I figured this was the best, and maybe the only way someone like me could do that. That was about 12 years ago, and I’ve been obsessed with it ever since. You mentioned you bought some books or you read something? Was there any particular mentor you wanted to give a shout out to? Is there anybody’s writing who, in particular, influenced you? Nate Rifkin : Yeah. There’s a big one. The one that changed my life, that one is Gary Halbert. He’s pretty easy to find online. Unfortunately, he’s passed away now, but he did leave behind a legacy called the “Gary Halbert Letter. This is someone who got started in direct mail. 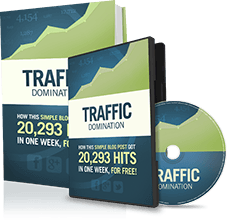 Gary Halbert is someone who generated millions and millions of dollars in a plethora of different businesses, who in time went on to teach how he did it. The Gary Halbert Letter is essential reading for anyone serious about about becoming a copywriter. Barry: It’s remarkable how many people tell me Gary Halbert was the big influence. As you say, he’s no longer with us, but his influence lives on. Nate, your 5-Question Formula For Writing Copy is a huge help for any copywriter, but are there any specific steps you may suggest for a first time copywriter? Nate: One of the biggest problems I hear is overwhelm. There are a million different ways to talk about something that you want to sell. # Before you write any copy you need to know exactly where your audience is at in terms of the problem they’re facing? # Do they know what options / solutions they have available? # What solutions have they already tried? For example, let’s say your potential customer has heart disease. In addition, perhaps they have high blood pressure. And they have already been to see their doctor. Before you write any copy you must do your research. If available, survey existing customers – what issues did they experience? What persuaded them to buy your product? Another place to look is on social media sites – they are particularly good for identifying the PAIN your prospect has. It is this PAIN you address in your sales copy! I also recommend Amazon.com for doing research – reading the reviews is another great place to identify pain. Are they aware of the various prescription options? Have they considered natural health supplements? What have they tried, and what are they trying right now? Then – and this is personal to everyone – you have to take stock of your solution and figure out if they’re even aware of its existence, if they’ve tried it before, and if they were satisfied (or not) with it the first go around. You need to know what they’ve used already and what happened when they used this previous solution. Nate Rifkin: Yes, either way, you have to know. I prefer ‘speaking’ to audiences that already have tried some standard solutions that didn’t work out. That’s when copywriting can be at its most powerful! At its best, copywriting is education-based marketing. Let’s say you’re offering a solution for heart health that has to do with lowering levels of homocysteine. Hardly anyone knows about homocysteine! Barry: I don’t know what it is, Nate. Nate: Exactly. I have failed to research the awareness of my audience, and as a result, everyone will ignore my message. Someone who has just been to their doctor, and discovered they have an issue with high blood pressure will want to read more. Indeed, anyone with high blood pressure will want to read more! You must speak your prospect’s language – no matter what the product or service. This is why the research is so important. It would have nowhere near the same impact! People understand blood pressure – Like I said, you must speak your prospects language. What’s funny about all this is I haven’t even really talked about writing yet. The phrase is copywriting, but all I’m talking about it getting familiar with your audience and knowing where they’re at. From there on, your sales message continues in the form of education. You figure out where they’re at. You figure out what they know, what they’ve already tried, and then you educate them on what the pitfalls were and what they should do next. For instance, in the blood pressure example, they already know about it, so you basically educate them on why other solutions are not as good. You may say, “You’ve probably heard of these prescription drugs. Sure, they might lower your blood pressure, but here is the problems with the side effects,” and then you continue from there. In the case with, like you said, you’ve never heard of homocysteine. Right off the bat, even before I mentioned the term, if I’m writing to prospects interested in heart health, I would describe how there is a certain threat to your heart that you have not heard of, and here’s why you haven’t heard of it. “Let me tell you the story. Let me tell you about this threat and what the science is behind it,” and then I would say, “OK, it’s called homocysteine,” and then — and only then — will I get to the part of the formula where I actually describe the solution, because I can’t describe the solution unless people know what the issue is. Nate: Yeah, but I do need to give credit. This is commonly referred to as “the state of awareness of the market”, and it was the book “Breakthrough Advertising” by Eugene M. Schwartz , who really broke this down. That book is out of print, decades old. You can find copies on Amazon selling for over 350 bucks per copy, but the secret juice of that book is pretty much what I just revealed, knowing where the state of your market is. Nate: I think that’s good for now, because the rest will be revealed as we go along. That’s kind of what I really wanted to hammer home, that first part of the state of awareness, so please fire away with what else you’ve got. Barry: You’ve semi-answered some of this question already, but just for clarification, what do you do first when you are asked to write copy about a product or service you have no personal experience off? Nate: The first thing I do is I stay away from that blank page, and I stay away from any heavy writing. As in the example above I dive deep into researching the background of the product, researching how it works, researching the problem it addresses, and researching the folks who are most in need of the product, because they’re the ones experiencing the problem. The market, the problem, and the solution, I research all that stuff. I’m looking for how does it work, and what is the news story I can tell in my education-based marketing? I’m also researching the problem itself, because I want to make sure that I understand it properly, for basically the same reason I understand the market. I want to make sure everything matches and aligned. I guess I might as well go with the same example. I will research what high blood pressure actually is, the science behind it, why it’s a problem, and in doing so I will find out some interesting things that I can reference in my education-based marketing. You see that is not how high blood pressure manifests itself and I will almost certainly break rapport with my audience, because they see that I don’t know what I am talking about. You may feel fine right now, and not know you have a serious blood pressure issue. Then that is more likely to grab attention. Then I want to research the mechanism behind the product, what makes it work, because I want to find out what makes it superior. I’m going to find out if there’s an herbal solution for blood pressure, I’m going to find out it actually brings levels, keeps it to the normal range, keeps them in the normal range, and it does this without any side effects. I need to know all these facts because people are so jaded today. You can’t just scream bigger and bigger benefits at them. In copywriting you have to address customer skepticism and given them a reason why something is going to work. I have to do my research, because if I don’t know my stuff, I’m going to be a terrible educator and then the entire sales message becomes a deck of cards and someone kicked at it like it’s a soccer ball. It’s all going to fall apart. That is the first thing I do. If I’m entering a new market with a new product, it’s even more important than ever. Someone asked me recently, how much of what you do is research compared to actual writing? Unless I know my stuff, it’s going to be like 80 percent research. Barry: 80% research! That is remarkable. Another big takeaway here is saying something that’s not correct. I mean, if that’s not what they’re experiencing, they’re catch you out and say, “You don’t know what you’re talking about,” and close the page, and go somewhere else. Nate: That’s crucial, and it’s very tricky, because kind of by definition it’s not something you can 100 percent watch out for, yourself. You may be working the project alone locked up in your room, but eventually, this is going to go out to other people and they are different people from you. It’s very helpful if you have someone you can share your writing with and get feedback. Someone who perhaps knows the product and industry better than you. And most importantly, “Am I saying something where you’re like, ‘No, that’s not how I feel. That’s not something I’m going through'”? That one little extra step can kind of save you from tripping over yourself with your words. Barry: Excellent, I like that a lot. I have been told that when writing copy, the headline’s the most important thing, and if you don’t get that right, you might as well not write at all. Do you have any particular hacks or secrets for coming up with great headlines? What is a good headline? Nate: I agree with what you say, because a headline…just think of it this way, it’s like a first impression when someone walks up to you and shakes your hand. In that five seconds, there is a lot going on. There is a lot of impressions being made, and a lot of them will never be unmade, even if you hang around that person for the next year. It’s kind of similar with headlines, even more so because if your headline isn’t going to grab the reader’s attention, they’re not going to hang around at all, much less for a year. When you’re aware of your audience’s awareness, when you know what they know, and you know where they’re at, you can craft a great headline that speaks to them exactly where they are, and introduces them to a new idea. Just as important as what a headline does is what it does not have to do. I didn’t say you had to sell your product. I didn’t say you had to get them to bust out the credit card and buy anything, or even believe you, or even necessarily trust you, not yet. You just want to get them to say, “OK, I’m gonna check this out.” That’s it. It’s kind of like a newspaper. People are aware of a current event going on. That newspaper headline grabs their attention because it speaks to what they already know, that something’s going on. It’s sort of an implied promise that they’re going to learn more information that’s very valuable to them. Barry: That’s perfect. I like that a lot. Do you have a best-ever headline that you’re particularly proud of, that you’d like to share with us? And if you have one, why did it work so well for you? Nate: Let me think. There is one that, not only, it’s very successful and I think could be a great example, here. Nate: There’s a number of reasons why it works pretty well. The audience that sees that headline is an audience that is interested in their health. If you walk into a Whole Foods, or a store like that, there are rows and rows of these premium-priced waters boasting of their alkalinity, so it’s on people’s minds. They’ve seen it. It’s something they can reference and it’s something they traditionally view as healthy, or positive, or certainly socially acceptable. A headline saying toss it down the drain, it’s going to make them go, “What? Why would I want to do that? As far as I know it’s good for me. Is it dangerous? Is it bad? Is it just stupid? Why? There’s only one answer and that is to keep reading to discover this reason why. Barry Dunlop: You’re really on fire, my friend. I appreciate your time. I was wondering do you have and ideas or thoughts on creating lead magnets or offers that gets people to opt into your sales funnel? Nate Rifkin: Sure. I’m not as involved in that as I am in the longer copy that sells the actual product, so I’ll be quick about it. I do have my ear to the floor of what’s working very well. Answering one bit of curiosity is always what works best with lead magnets. Is oatmeal good for me? Or is it bad for me? Naturally I want a copy of the report so I can discover whether or not oatmeal is good for me. One little thing is all it takes. One is infinitely better than two, three, four, five, or six. When creating a Lead Magnet pick one thing that sparks folks so much they just need to know the answer to it. Barry Dunlop: Yeah, that’s great. Now that all makes sense, my friend. You’ve been a copywriter for a little while now and things change. Is there anything in particular that used to work and doesn’t work now, or vice versa, for example? What’s working right now that people really should know about that is relatively new on your scene? First is what’s not working well. In terms of the state of awareness of the market people have increasingly already tried a lot of different solutions for their problem and have not been satisfied with those solutions. This is quite a different scenario from say a few decades ago. People and prospects generally are a lot more jaded these days. When you’re writing an ad and you’re not addressing the facts that people have tried other things and they did not work, you’re going to have a real tough time selling them. I mean, how are they not to know that what you offer them will not FAIL them also? The second thing I would mention is that your marketing should match the media that the buyer is consuming on a regular basis. 30 + years ago, when Gary Halbert was in direct mail, he would send out sales letters that looked like letters because that’s what the person wants to read, a letter. It didn’t need to be a fancy catalog with amazing graphics. However, when Gary ran ads in magazines, he made sure to format them like magazine articles because that’s just the easiest, most convenient thing for people to consume. Their defenses are down and they’re open to your message. It’s the same thing with television when infomercials came out, they would often be in a format of news programs and interviews. That is what I mean by matching your message / sales copy with the media format that your buyer is used to watching / reading. Today we’ve kind of figured that out in terms of presenting things with video, and also presenting things with pages that have pretty nice graphics that make it look like a nice WordPress blog. Those are the two things — making sure that you’re up-to-date with just how many solutions your audience has tried and failed with, and also making sure that your sales message matches what people are used to seeing on the Internet. By the way, an easy hack for that is to just look at the most popular media blogs and publications and social media sites. If you can mimic the look and feel and experience of them, you’re going to be delivering your content in a way that your audience will appreciate and consume better. Barry Dunlop: That’s a very strong tip, Nate. Do you have anything else you’d like to share with us that you feel would be valuable to our audience? Beware of the curse of knowledge. It’s an advantage that you know your stuff, you have your product line, and you have your facts down cold. The curse of knowledge is you might be speaking to your audience in a way that’s a little bit too in-depth or fast for them. My words of wisdom would be, take a step back. Make sure, even before you’re selling or asking for an order, make sure your audience gets it. Make sure you understand where they’re at. Make sure that they get why your solution is better. If you can show them that you know where they’re at and why your solution is better, they’ll credit you with knowing your stuff and more importantly, buy from you! Provided the above is applied then the selling part will be a very easy, natural, and mutually-beneficial process from all! Barry: Thanks Nate, that is an awesome summary. A great deal of value for here, for both the apprentice copywriter and the seasoned pro!